Brazilian Embroidery Sampler Block 12 - A Very Special Columbine! 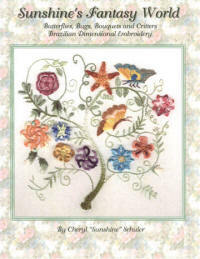 - Learn Dimensional Brazilian embroidery and incorporate the stitches into your crazy quilt! 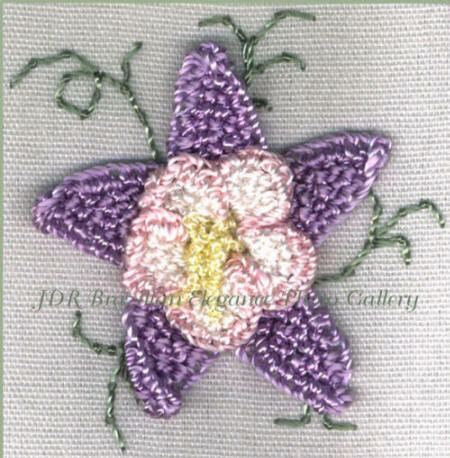 This is an ADVANCED flower with detached buttonhole stitches & drizzle stitches. Combine the squares to make a fabulous quilt sampler. Each of the designs have enough white space (fabric) around them so that you can frame them or make small pillows. These can also be mixed with the JDR Learning kits for more blocks for your quilt. Directions for all the flowers are included. You MUST know how to do of these stitches: Couching, drizzle Stitch, French knot, and several rows of detached buttonhole stitches. 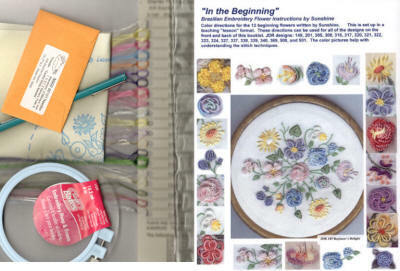 Directions for these stitches can be found in the book “Sunshine’s Treasures, Book 1” by Cheryl Sunshine Schuler. ♥ A Very Special Columbine!